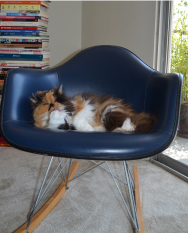 WuvLuv Designs is a passion project for creating objects of modern love and luxury for cats. Why WuvLuv Designs? Whenever I went on business trips, I wanted to bring home a fancy souvenir for my cat, Buffy, aka WuvLuv. I quickly found out it was a dog’s world out there. I would go into a pet store and the majority of the items were for dogs. Where were all the fun and creative items for cats? So when I became unemployed from my corporate job, I enrolled in a Product Design class at Otis College. Our first project was to create a food delivery concept. A modern cat food bowl became an obvious choice. I focused on the ergonomics of cat bowls. I saw how Buffy had to bend down to get to her food. The shape of her bowl resulted in food being pushed against the sides. I decided to develop a bowl that was elevated and tilted so the food was easier to eat.